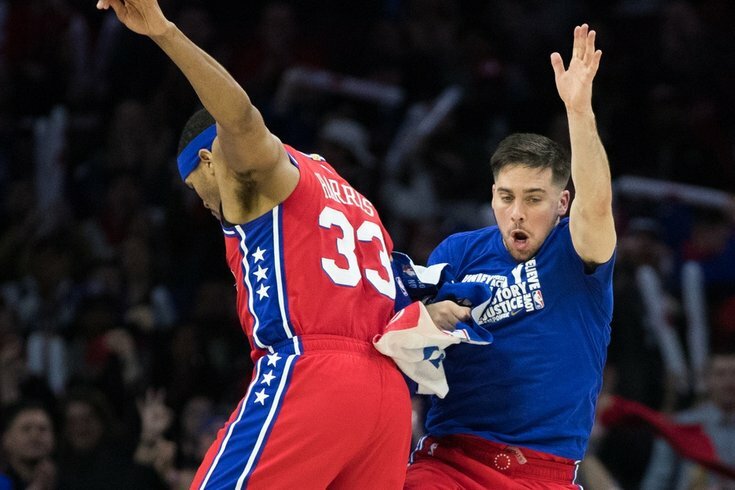 Philadelphia 76ers forward Tobias Harris (33) reacts with guard T.J. McConnell (12) after scoring against the Denver Nuggets during the fourth quarter at Wells Fargo Center. Tobias Harris' arrival could mean a lot of things for a lot of different Sixers. Is it a hedge against Jimmy Butler leaving this summer? Will it take the ball out of the hands of their other stars, starting a tug-of-war over touches? Is Brett Brown ready to coach in high-pressure situations with a talented cast? All of those things sound (and look) like afterthoughts right now. Following the example set by the new guy, the Sixers won as a collective against the Denver Nuggets, starting off this new era on the right foot. And in the moments following the game, Harris and his running mates made it sound like playing this way was the only real option. With the collective basketball universe fretting over who would get touches and how that would impact their happiness, Harris shut down any concerns on the topic very quickly. "You can get a million touches on a bottom-five team," Harris said following the game. "But you look at the game and see the shot distribution, the field goal percentages, and at the end of the game, you see 117-110. That's the thing about the league now, everybody gets so caught up in the numbers, but you win, you have fun, there's a joy to the game...it's that little bit of sacrifice everybody has to take, just a little bit, for the greater goal. And that's to be the team we want to be." "That's got to be the mindset, I know personally coming into the situation that was going to be my mindset of how to help this team. This is just one game, but we're going to continue to get better, there's going to be ups and downs, it's just about how we weather that." As Harris himself would admit, Philadelphia's problem is that they were too unselfish at times on Friday night. The Sixers picked up a pair of three-second violations on plays in the second half where the ball kept swinging, even though good shot opportunities had presented themselves to Philadelphia. Those are problems the Sixers, Brett Brown in particular, are happy to live with. His offensive philosophy is rooted in the history of the San Antonio Spurs, where the pass and the collective win is king. Philadelphia did plenty of damage in isolation situations, with their top talent bailing them out of possessions that probably should have ended in failure. But the ball never stuck, and even on the plays that ended in isolations, they were all sensible, with Philadephia's stars attacking the mismatches that will come their way every night with this group. There’s always mismatches... You got guys who can post, guys who can shoot the ball, knock ‘em down and I think it’s going to be tough to really guard us. They can already see the terror this style of play is going to inspire in their opponents, sloppy as they were at times on Friday. "There’s always mismatches," Ben Simmons said after the game, "and I think that the team, the five that we had at the start, that’s going to be tough. You got guys who can post, guys who can shoot the ball, knock ‘em down and I think it’s going to be tough to really guard us." It is on this group to recognize that and understand that with each night and different matchup, it will be someone else's turn to go to work. On Friday, JJ Redick was cooking, and the Sixers kept feeding him throughout the night, new additions and entrenched stars be damned. There will be opportunities for Joel Embiid, Harris, Butler, and even Simmons to do the same. And while the head coach will try to impose his influence on the group, it is ultimately up to their best five to invest in one another. Brown said as much before the game even started, as he detailed how he believed this project would come together over the next couple months. "You want to pass and you want to play and you want to move," Brown said on Thursday evening. "It's not my instinct to act as a waiter, like he needs to eat, now he needs to eat, let's deliver food. That's no way to play or coach. And so to share the ball and coexist and to read the sport interests me the most." "Somewhere out there with that belief, a strong belief, is ultimately the answer...when we all look up and it's 102-102 with four minutes and 30 seconds left, that changes for me too. But in general, trying to get him shots and trying to get him shots, they're going to get each other shots. Some of this they're going to have to figure out themselves, some of this is going to be organic." The Sixers beat the Denver Nuggets on Friday night because they have one of the most talented five-man groups in the league, yes. But they also won because they each did their part, including Embiid, who overcame a brutal night from the field by turning in a heroic performance at the defensive end. "I think when we go back and look at film of this game and even you can see from this game pockets in the game where you said, dang, this is something scary there," Harris said after the game. "I always knew the talent from afar, but going out and playing and seeing it today and seeing how much spacing we have on the court and playmakers, was big."